Are any of you stuck with blah window blinds like I am? 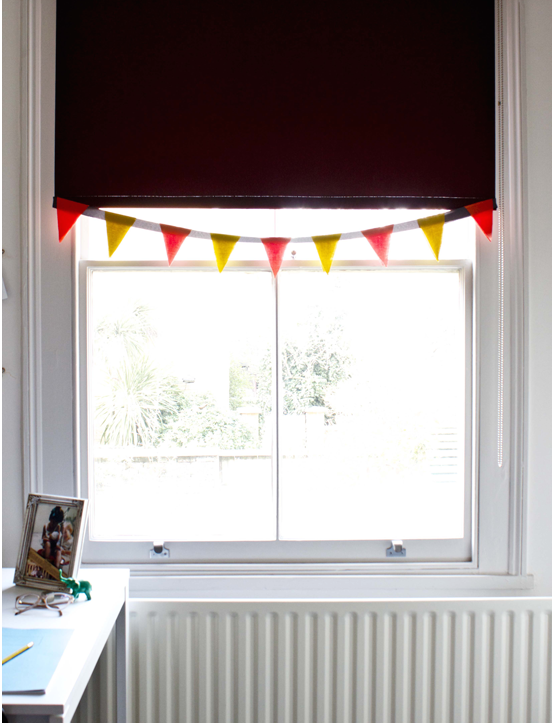 As a renter you often don't get to pick and choose the primary decor of your home but with these three quick and easy window-dressing ideas you can add your own personality and have some fun. Because I live in London, and have grown to love the English tradition of bunting, I used remnant fabrics and a single ribbon to create my own festive flags. It was crazy simple. To give a bit of depth to each triangle cut diamond shaped pieces and fold them in half. After stitching each flag onto the ribbon use a large paperclip to create a solid end and then insert it into the bottom opening of the blind (where a rod or stick usually is for weight). 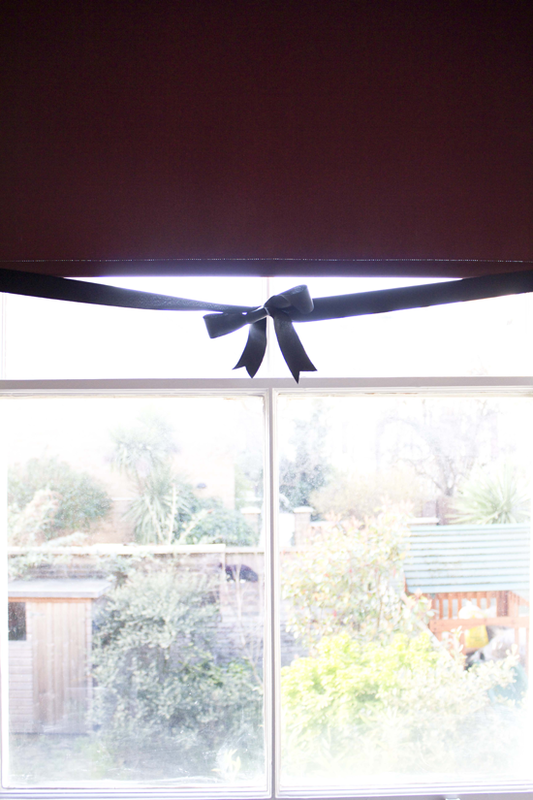 Do this on both ends of the ribbon/blind and it will hang on its own! 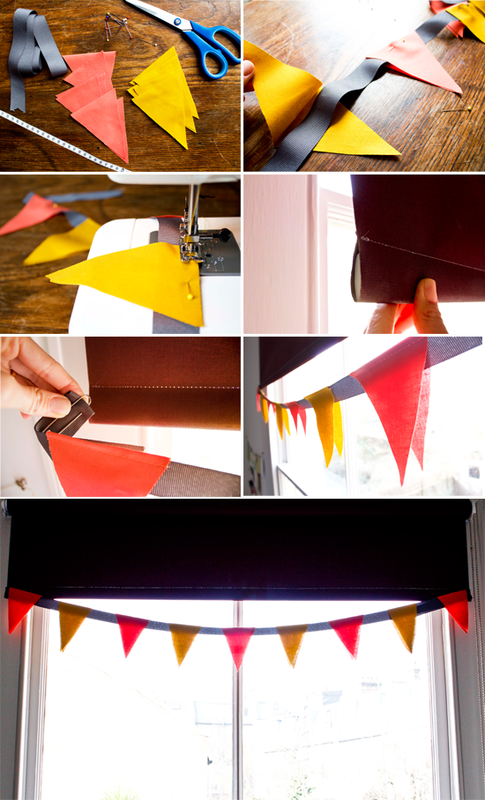 If bunting isn't your thing then you could try playful trimming with pom poms (also inserted using a paper clip) or a single long ribbon that is fed through the bottom slot and then tied in a bow as shown below. 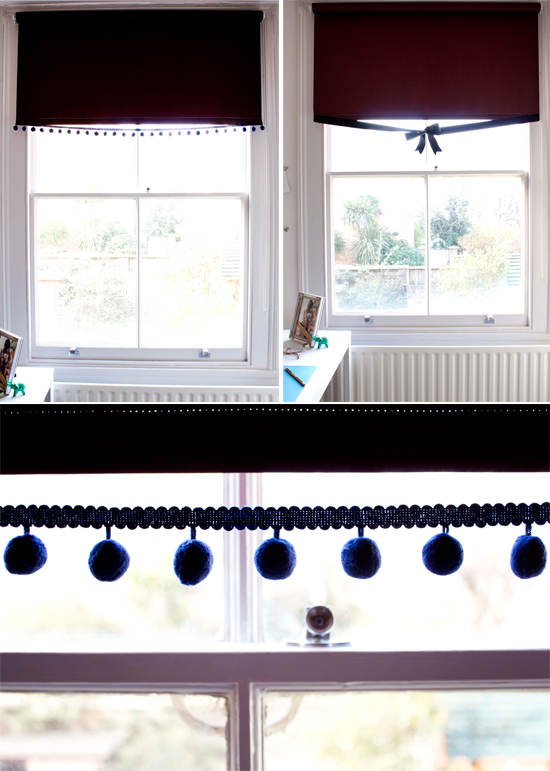 The bottom opening makes it possible for LOTS of different takes on styling your blinds. I did this in my office/guest room but it could be so fun in a nursery or children's room, too. So how about it, think you'll give it a shot? Have any other dressing ideas to throw into the mix? An LA native living in London, Ana Maria is a flea market fanatic with a knack (and love) for DIY. She shares her vintage finds in her online shop, The Pond Market, and captures her adventures and inspirations on her personal lifestyle blog, Anamu. How lovely! These are fabulous ideas. As a renter, I definitely appreciate this post!